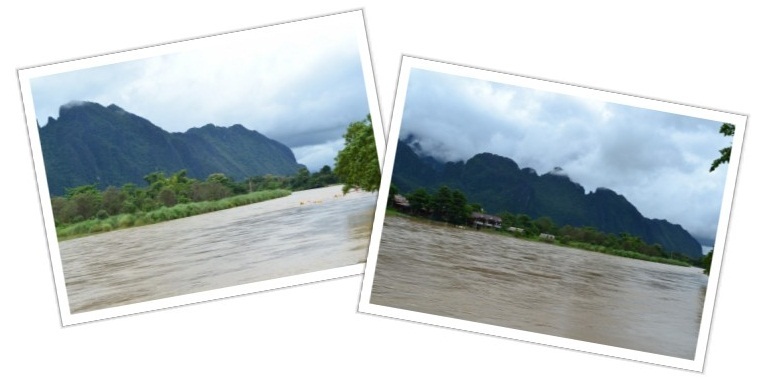 The nation of Laos is officially known by the name of Lao P.D.R. (People’s Democratic Republic), but to many travelers this name also symbolizes a deeply rooted part of the Lao identity. It is often said that locals operate on “Lao Time,” meaning that they are friendly and helpful, but in no particular hurry to get anything done. 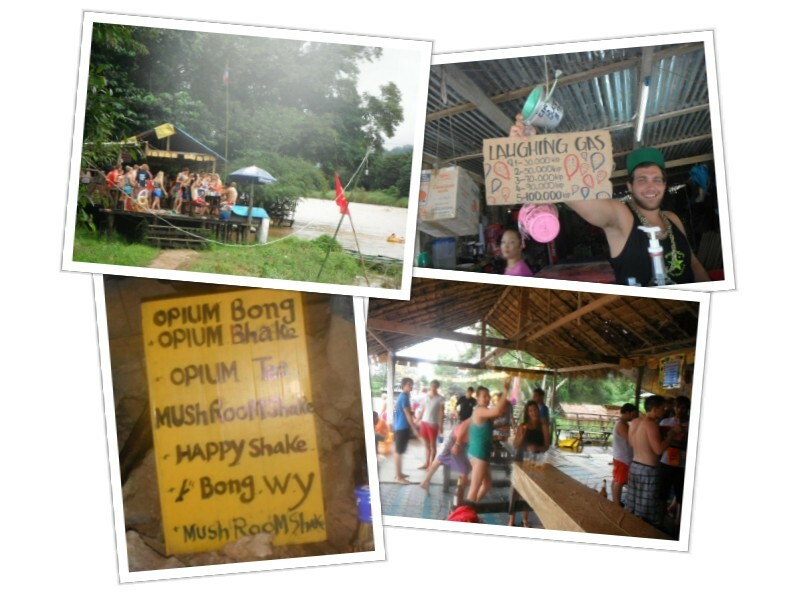 So backpackers have dubbed it with the not so official name of Lao P.D.R. (Please Don’t Rush). We embraced the P.D.R. attitude and took our time exploring the town and outskirts of Luang Prabang. 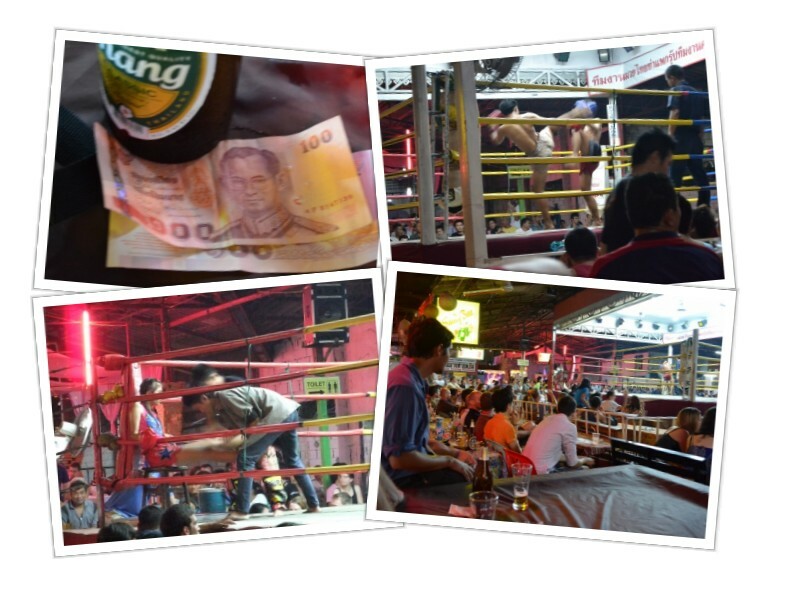 It was a welcomed change to move away from the backpacker party scene in Vang Vieng and into the beautifully serene and laid back town of Luang Prabang. 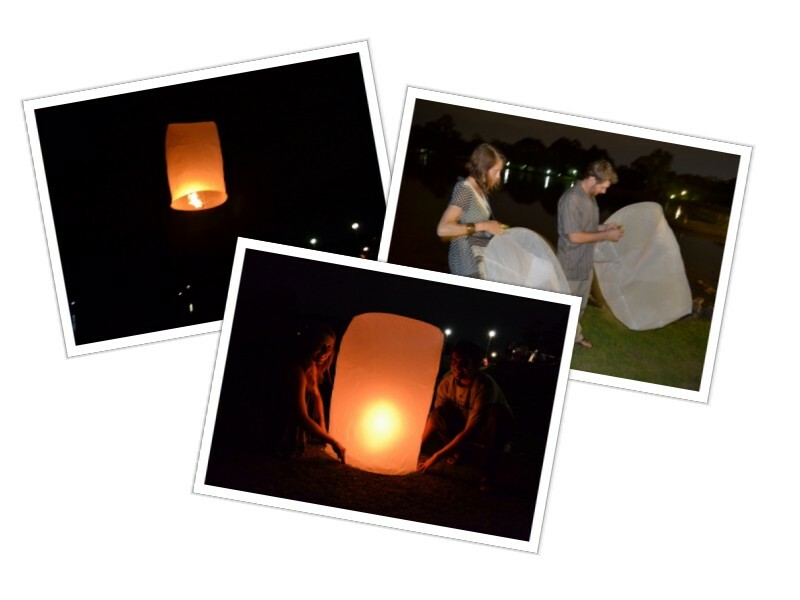 The town even has a nightly curfew of midnight which contributes to its low-key environment. 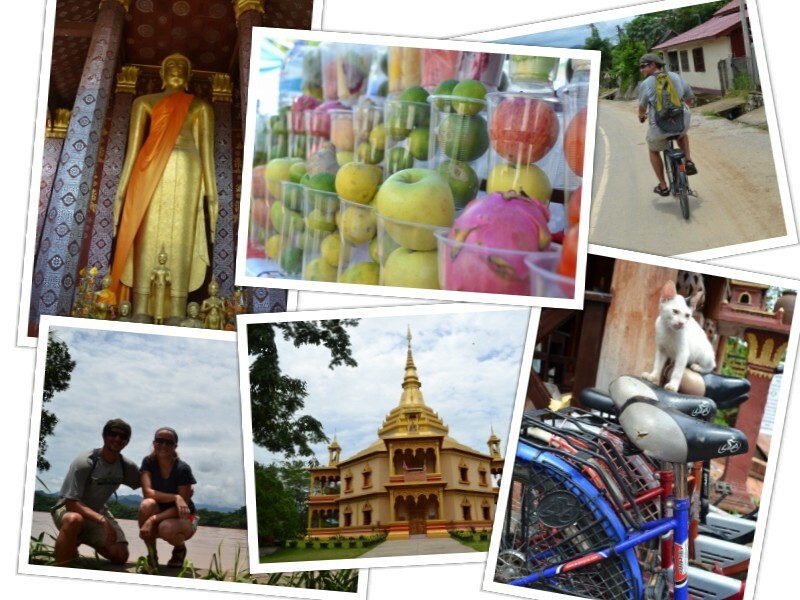 We hired bikes one morning and set off to explore the rolling hills that surround Luang Prabang. 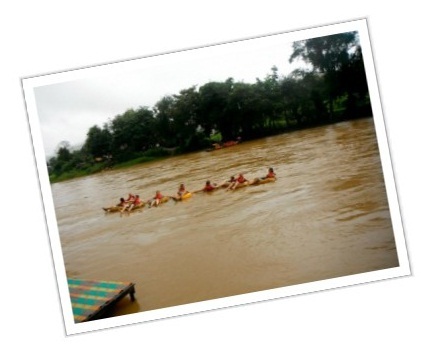 The Mekong and its tributaries wind through the landscape while temples and shrines speckle the countryside. On our single-track bicycles, we quickly learned that the “rolling hills” are steeper than they appear. Hydration stops and fruit shake breaks helped us get through the toughest parts. Waking up very sore and stiff the next morning, we opted to take a boat cruise up the Mekong River. 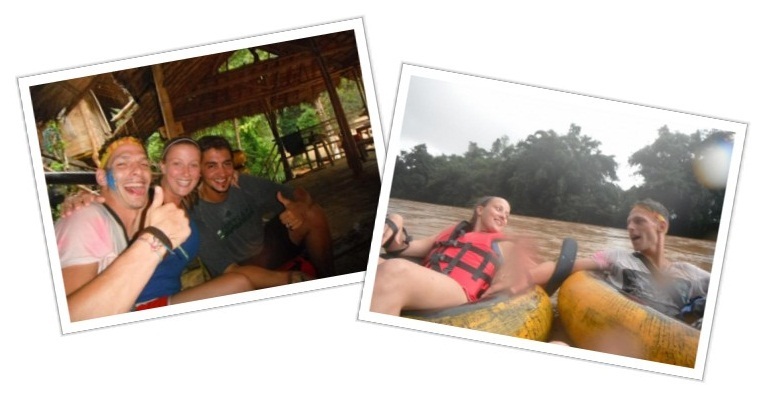 We piled on board with two other couples and set off towards some villages and caves up river from Luang Prabang. 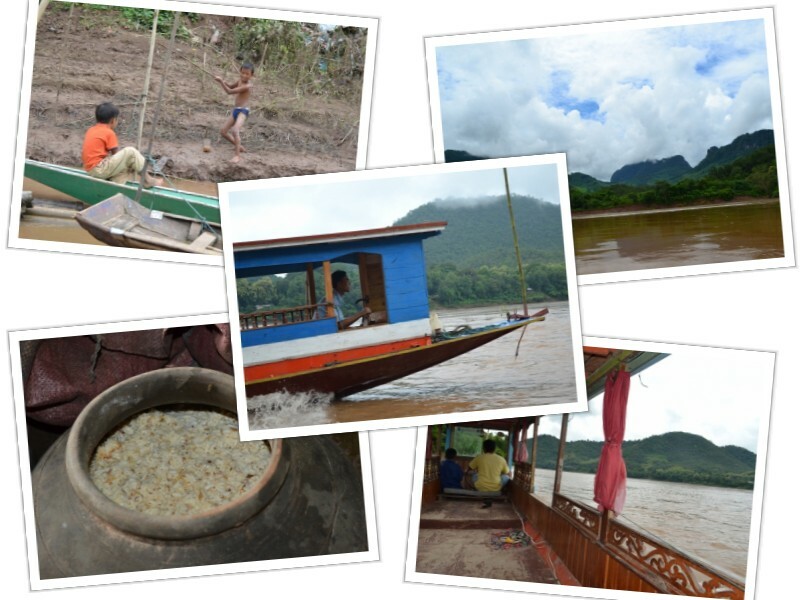 There is something so mesmerizing about the Mekong. It really embodies the “please don’t rush” mentality as it meanders its way through the lush green countryside. The muddy brown waters were running high from the recent rains which made the journey to the cave a bit slower than usual but equally if not more beautiful. We stopped in a small village whose specialty is lao lao whiskey, made from sticky rice, had a few tastes for good measure, and kept on our way. The caves at the end of the trip were more impressive than we’d imagined. For thousands of years, the two caves we visited have been used as places of worship. 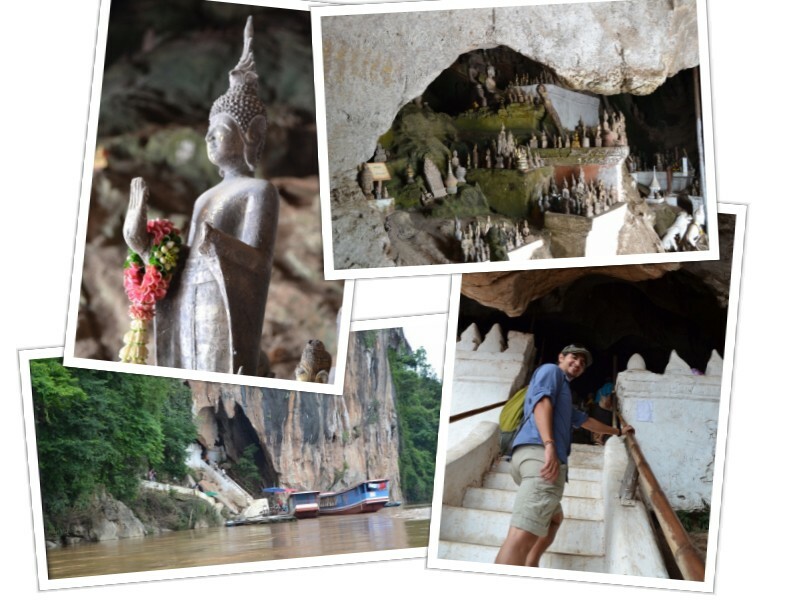 The native people of Lao used to worship spirits of nature and believed that the riverside caves were connected with the water gods. 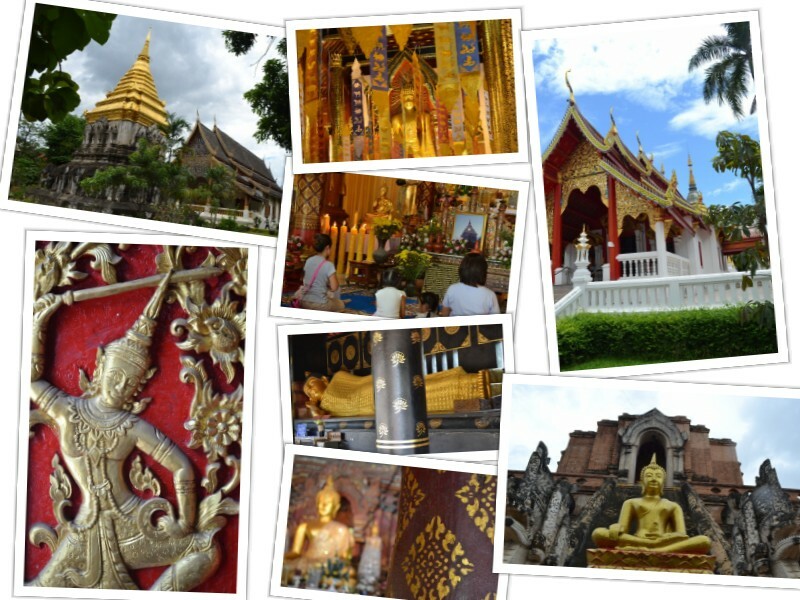 After Buddhism arrived in the region, the caves gradually became religious shrines and house countless statues of the Lord Buddha left as offerings by faithful pilgrims. 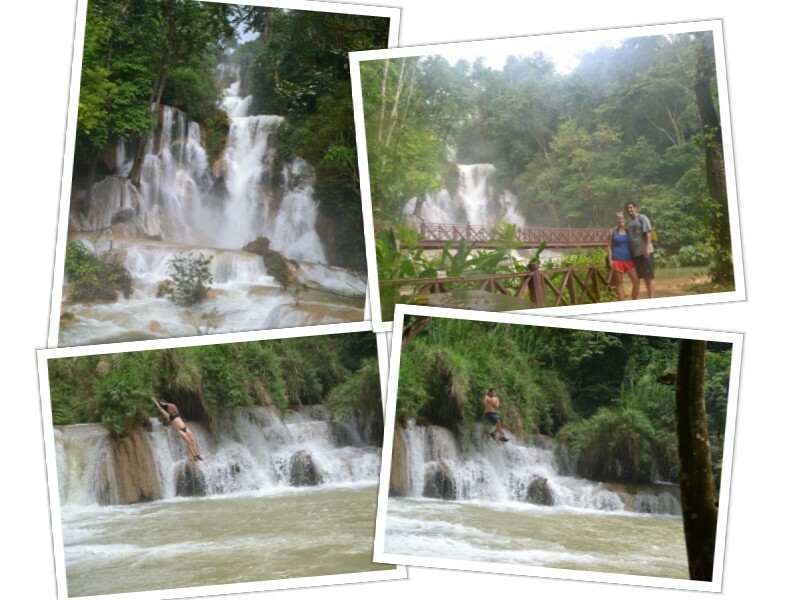 Another well-known attraction in the area is Kuang Si Falls. When it comes to waterfalls, Amy is hard to impress. The many falls of the Colombia River Gorge near her hometown of Portland, OR are tough to beat. This particular waterfall definitely met her expectations. At first, it seemed like nothing more than a fast flowing jungle river with some small drop offs, pools, and rope swings. As we made our way upstream, we stopped for some fun and took a few turns on the swing ourselves before running into one of the most spectacular waterfalls we have ever seen. This bad boy seemed to stretch on forever as it disappeared into the clouds escaping the reach of our camera lens. 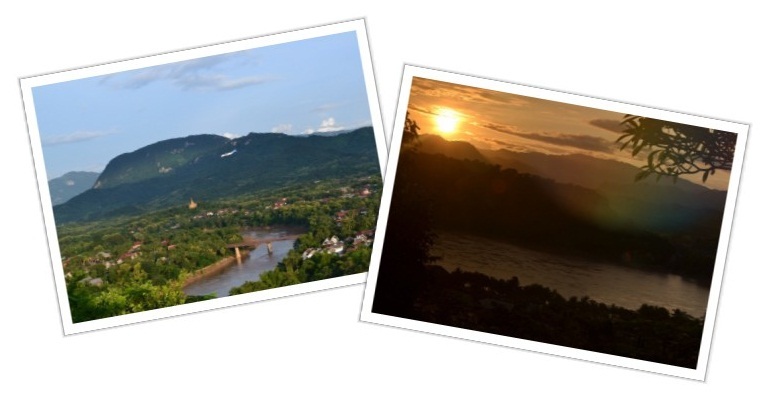 Luang Prabang is the type of place where you can easily get swept away by the nightly market, amazing scenery and easy going locals. Our goal of circumnavigating the globe, however, means that we have to keep moving, even when we want to stay. 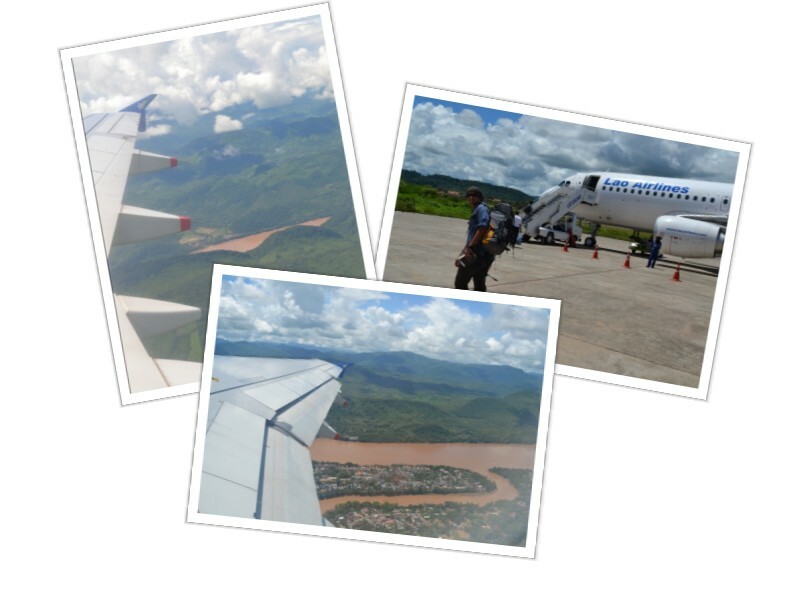 The lengthy bus ride through winding, mudslide-ridden, mountain passes that we took from Vang Vieng to Luang Prabang was more than we could handle for a second time, so we opted for a short 30 minute flight to Vientiane. 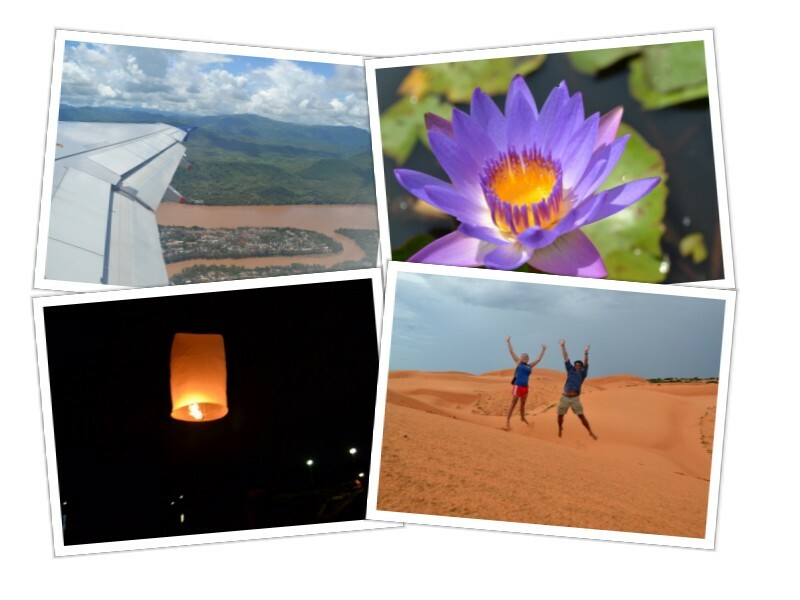 In true Lao fashion it turned out to be the easiest and most stress-free travel experience of our trip so far; factor in the brand new airplane, tasty on-board vegetarian snack and breathtaking aerial views of the Mekong, and it may go down as the best flight ever! One question that we get a lot revolves around how we plan our travels. People want to know if we are using an around-the-world plane ticket, or if we have just been flying by the seat of our pants. We have been operating somewhere in between. Early on in our trip, we did have some plane tickets booked in advance, for example our departure from the States to Spain and our visit to Denmark. Knowing that we have tickets paid for and dates set helps build a certain type of excitement, but midway through Europe, we took our last scheduled flight; at that point, we were truly free with no solid future plans. It felt great, liberating and new. After some weeks, we realized that we wanted to visit destinations that required flying. 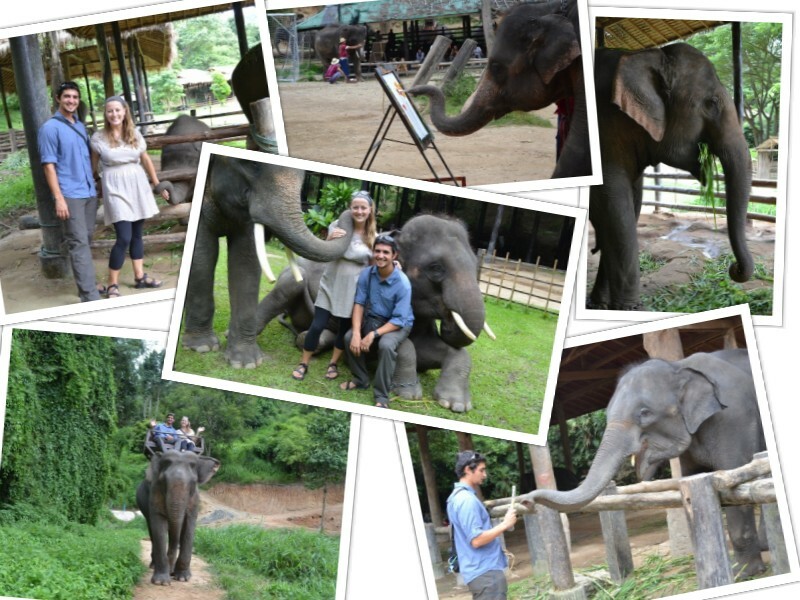 So, in an effort to save money, we booked our airfare to Asia. Following a couple more pre-arranged flights to China, South Korea, Japan, and Vietnam, we again switched into open-schedule mode through SE Asia, purchasing last minute buses and trains as we pleased. Traveling with no concrete plans is the way to go in this part of the world. It’s so easy to hop around that we found ourselves in places we had not intended; truly letting the road choose our course. The only certain thing in life is change, and as the months slipped away, we again found ourselves faced with some long distances flights approaching. Nature gave us the nudge we needed. 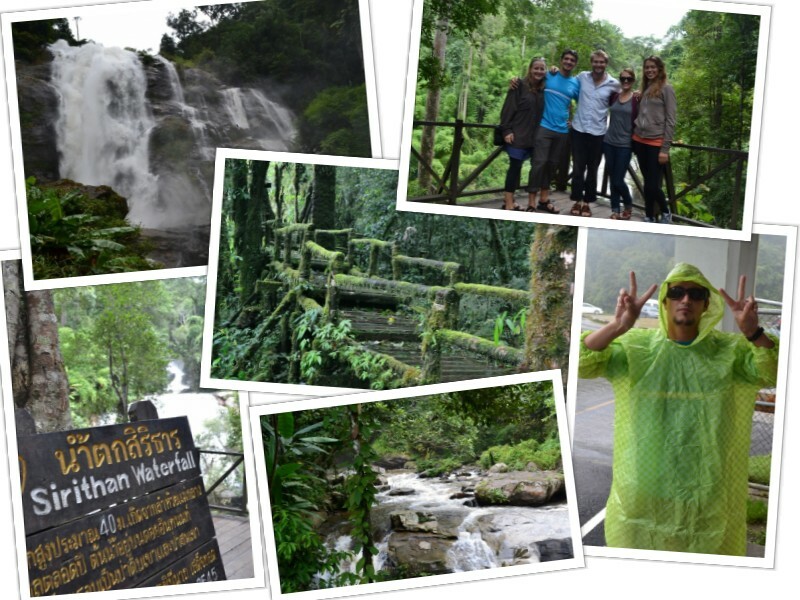 Trapped inside during a monsoon downpour in Luang Prabang, Laos, we went on a booking frenzy! When the dust had settled, we had booked six flights and laid out a time table for the next four months of travel. Singapore: A weekend in this intriguing city-state. 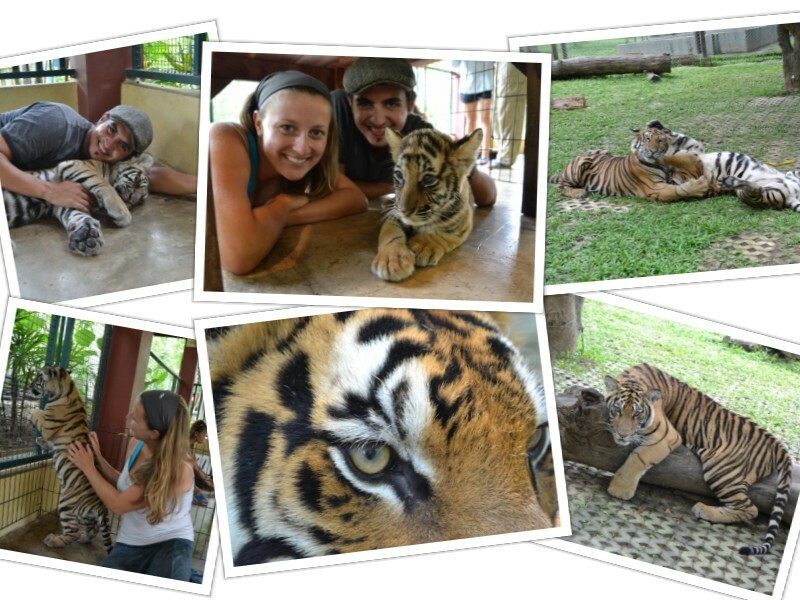 Sumatra: Indonesia’s large but lesser explored island. Malaysia: SCUBA diving in some of SE Asia’s most well-preserved waters. Australia: A week visiting friends in Perth, plus a trip to Sydney. New Zealand: A month of road-tripping and trekking around the north and south islands. Chile: Returning to where Mike studied abroad, Thanksgiving, Amy’s birthday (her parents are meeting us down there!) and a wedding to top things off. Argentina: Christmas and New Years with some of Mike’s family. We have found this approach of on-and-off planning to be a great way to piece together our RTW trip. Advanced booking means locking in lower airfare for long hauls, but once you reach a fun region of the world, leaving the “meat” of the journey unplanned keeps every day feeling fresh. 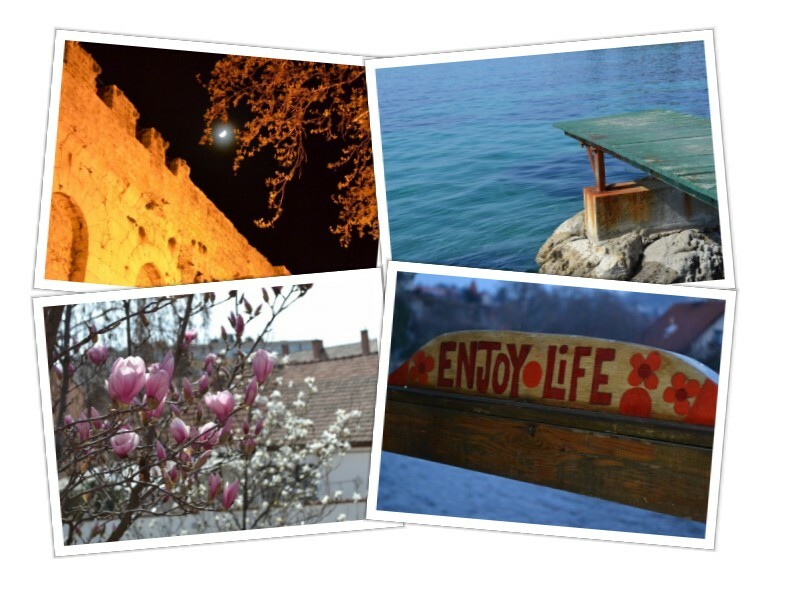 We look forward to blogging about our up-and-coming adventures on the road! If you have any travel suggestions for these parts of the world, or if there is anything in particular you’d like us to write about, let us know. Cheers! Guidebooks: Love ’em or Hate ’em? 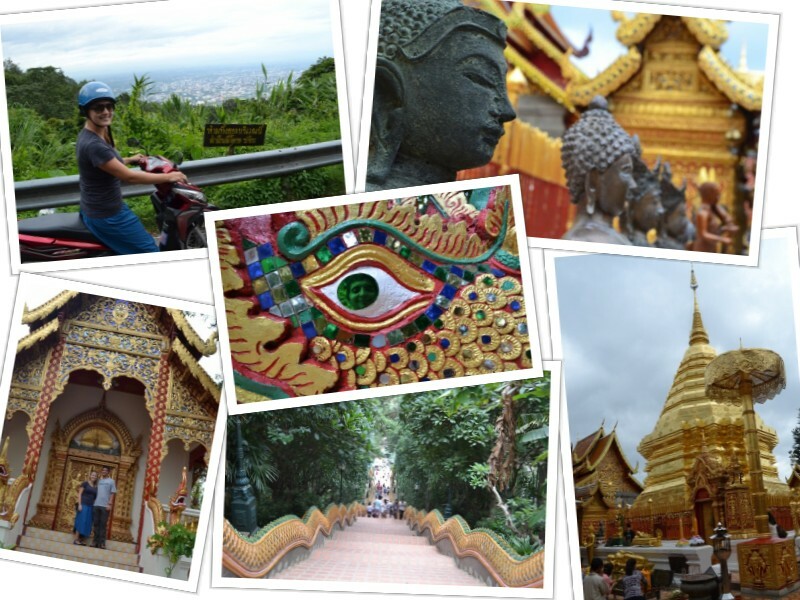 While on a 15 hour train ride across Thailand from Bangkok to Chiang Mai, we decided to kill some time by writing a blog post. We were going to write about another of our adventures, but then something on the train caught our eye…Travel Guidebooks. As we looked down the aisle, Lonely Planet, Frommer’s and Fodor’s were in the hands of nearly every backpacker on board. We’ve discussed our dislike for guidebooks before, but at nearly seven months into our RTW trip, our pent-up emotions about these over-hyped stacks of bound paper has reached critical mass. To all our fellow globe trotters out there, we wish to inform you that despite what you may have heard, Lonely Planet is NOT the Bible. Yes, both books are ridiculously thick and claim to have all the answers to life’s questions, but one has served as the basis of a religion for millennia while the other has a new edition every year (we know the Bible has many editions too, but you get the picture). We are constantly amazed at the number of travelers we see who won’t dare do a thing without consulting their holy book. “Better not stay at this hotel, looks great but it isn’t listed here on page 163.” “Mmm, this street food smells delicious, but the book says that it may cause traveler’s diarrhea.” If you only do what the guidebook says, you’re missing out on a whole lot. Travel guides claim to be a great resource for the independent traveler, but how independent are you really if you’re reading the same damn book as everyone else? Like our friends at UNESCO, guidebooks have a way of massively publicizing truly special travel destinations, which in turn, leads them to become nothing more than a check mark on people’s bucket lists. “This restaurant is a hidden gem amongst the bustling streets of Tokyo.” Well now that you just told the whole world about it, it’s probably not too secret any more, is it? We are not quite done yet. Do you have any idea how much a guidebook costs? 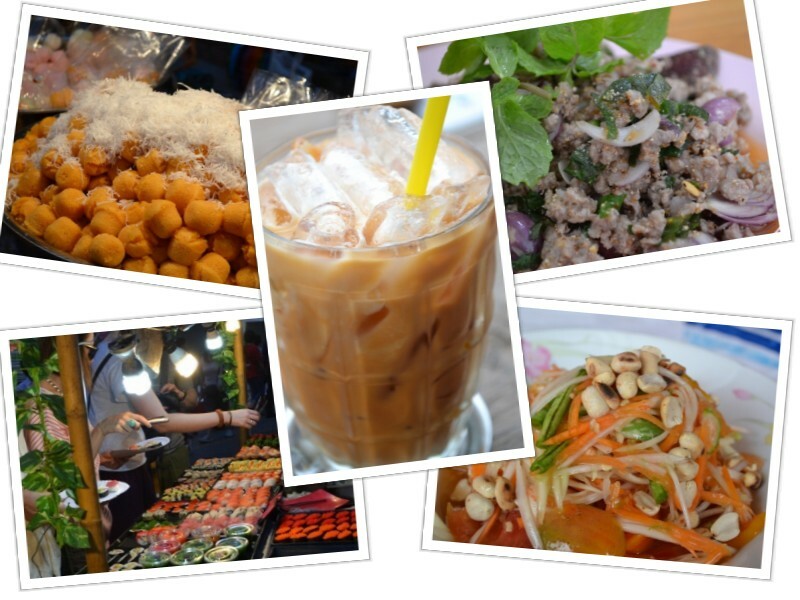 If we bought one for each country on our RTW itinerary, we would be out nearly a thousand bucks. We used to think college texts books were the biggest rip-off around; then, we decided to travel the world and found out who the real crooks are. Why pay so much for information that is out of date before it is even published? We find that online forums provide much more accurate and useful information. The cost of these: FREE. Perhaps it’s our desire to travel the unbeaten path that makes us hate guidebooks, or maybe it’s that we don’t want to see all of the same faces in every city as we make our way around the world. Either way, it’s not hard to realize how empty guidebooks’ suggestions are. Just pick up a copy of Lonely Planet for your country, flip through to the section on your hometown and read it. You’ll notice how much they’ve left out. So now you have it. That’s our two cents on the guidebook industry. However, unlike the producers of these texts, we don’t think that our opinion is the only one that matters. We want to know what you think! Please take our poll below and/or leave a comment to share your thoughts about guidebooks.